New numbers from the Census Bureau show that cycling to work in New York continued to grow last year, with the city breaking an important symbolic barrier: The percentage of New Yorkers regularly commuting by bike now stands at 1 percent. More than 36,000 city residents regularly commute by bike, up significantly over just a few years before. Counting the number of people on bikes has long been an imprecise science. While Transportation Alternatives estimated the number of New Yorkers on two wheels each day at 236,000 in 2010, there are a number of assumptions and extrapolations that keep that from being a hard-and-fast-number. Often, it’s more instructive to look for trends in imprecise, but consistent, measurements (like the Census numbers) over time. Each year, the U.S. Census Bureau releases new results from the American Community Survey, which provides estimates on a wide variety of demographic topics, including commuting. On a rolling basis, the ACS asks Americans how they “usually” got to work in the previous week. The question does not accept multiple answers, so someone who commutes by both bike and train, for example, would have to choose only one. The survey does not measure non-work trips. Last week, the Census released one-year estimates for 2012, which included some notable changes outside the margin of error. The Census estimates that the number of regular bike commuters in the city last year was 36,496, up from 26,243 in 2007. The percentage of working NYC residents who commute by bike is also up, from 0.6 percent in 2007 to exactly 1 percent today. This number is below other cities, most of which have worse transit service and are geographically much smaller than New York. In Washington, DC, 4.1 percent of working residents regularly commuted by bike last year; it was 3.8 percent in San Francisco, 2.3 percent in Philadelphia, 2 percent in Boston, and 1.6 percent in Chicago. NYC DOT collects bike ridership data by counting cyclists entering and leaving the Manhattan CBD on the East River bridges, the Staten Island ferry, and the Hudson River Greenway. The city’s screenline count has shown uninterrupted, robust growth since 2008, rising 58 percent. 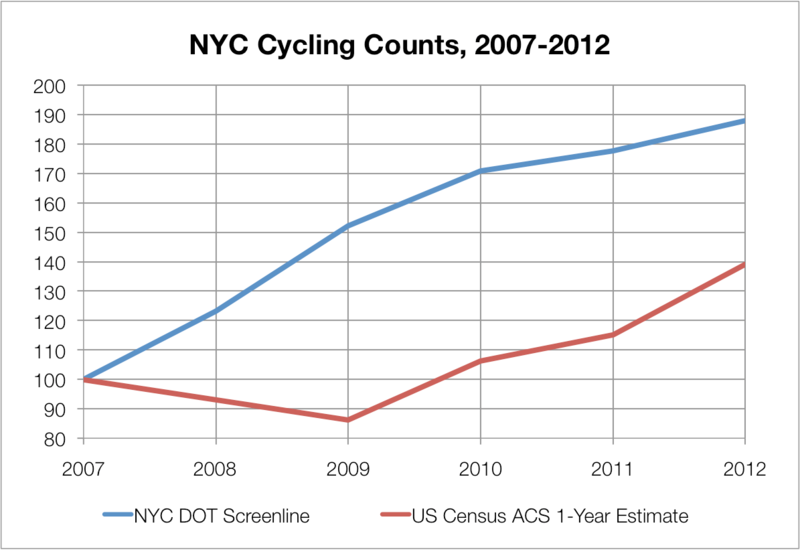 In 2012 the Census measured a bigger increase in cycling than the screenline count. While it’s hard to say why, one potential explanation is that bike commuters may be more likely to bike year-round and thus register in the Census survey. This would be consistent with the increasing number of winter cyclists DOT has counted crossing the screenline, which shot up last year while warm-weather cycling stayed flat. How does the DOT do anything to try to count commuting that doesn’t involve the bridges? i.e. the commute of practically everyone working in Brooklyn or living in Manhattan, the two boroughs with the most bicycle commuters? I’m assuming that is what the TA number tries to do but it would be nice to have a number from a neutral party. Stephen: Please retire the link to the April 2010 S’blog story. I subsequently revised my methodology; plus, the DOT screenline counts have changed with each new year. My current methodology + estimate may be found at http://www.komanoff.net/bicycle/NYC_Bicycle_Levels_Komanoff.xls. Daniel: Extrapolating from the screenline counts to intra-borough bike travel is indeed terribly difficult. I’m working on a brand-new approach involving less guesswork, and hope to have results before the new year. Just anecdotally… I moved to San Francisco two years ago for work, and moved back to NY just a few weeks ago (I’ve commuted by bike in both cities for 18 years). The difference in NY from two years ago is -very- noticeable: vastly more people on bikes, far more bikes parked everywhere, much better infrastructure. I used to feel like I was a rare outlier, and now that I’m just part of — well, maybe not the mainstream, but a noticeable minority. I really wish we could do some surveys much like Portland has done in the past. One that asks people about more than just their commute to work patterns. Far more people are using bikes for errands, dinner outings and recreation than will ever show up on Census counts. I also wish we could see a breakdown for numbers in Manhattan and other places such as Brooklyn Communities like DUMBO, Park Slope, Carroll Gardens and Williamsburg. And even Long Island City in Queens. There are certainly areas of NYC that must have between 5 and 10% bike mode share on some weekends. Heck the last time I rode the waterfront between W’burg and Red Hook, I saw more bikes than cars on the road. When you are talking about 8 1/2 million people, well 1% of those are great as a sheer number. But for it to equal 1%, that must mean there are areas of Staten Island, the north Bronx and eastern half of Queens where the bike commute share is .01%. I think if we can show the numbers are far higher in Manhttan and both sides of the East River where there are large numbers of cyclists, then we can make a greater case that the 1% is not the full story. So yes, I agree that averaging the bike mode share of popular parts of Manhattan and Brooklyn together with all of the city dilutes the information considerably. I don’t know if we’ll ever achieve a 10% share citywide, but in certain parts of the city we may have reached it already. The Brooklyn Committee of TA did mode share counts at Bergen and 4th during successive weekday morning rush hours and found that bikes averaged about 30% of the overall traffic. There were certain 15-minute periods where the mode share was 50/50 bikes/cars. We did counts on Kent Ave in Williamsburg on weekends and there were longer periods where bikes outnumbered cars. And that was almost exactly a year ago. I can only imagine it’s gone up since then. The fact that people can only select one answer makes counting problematic, especially now that Citibike is enabling lots of suburban rail commuters to commute by bike as well. Even the long-distance bike commuters I know only do one 20+ mile leg per day by bike. The other is by train. Although I guess people who commute by car have to walk from the parking lot to their desks. This puts NYC in a tie with Los Angeles at 1% bicycle commuting modal share for 2012. I’d expect LA to move up in the 2013 results after installing 153 miles of bike lanes in the last two fiscal years. NYC installed 193 miles of bike lanes in six fiscal years from 2007-2012 and seems to have been including sharrows when announcing the miles of bike lanes installed under Mayor Bloomberg. LA and NYC are close in total miles of streets and size in square miles. Its also notable that NYC didn’t get a increase in ACS results until 2010 after installing 150 miles of bike lanes for fiscal years 2007 through 2009. That’s why its not surprising that LA didn’t get a ACS increase for 2012 after also installing a large amount of bike lane miles in a short period of time also. It takes time for people to change their habit of which mode of transportation they use daily. The so called dip in bicycle commuting mode share from 2008 to 2009 is within the margin of error for NYC in the ACS survey results. This amount of growth in mode share is about average for the largest cities in terms of miles of bikeways installed compared to the square miles for the city. Citibike is probably influencing people to start using their own bicycles more frequently after they grow comfortable using bicycle sharing on a daily basis. That’s what happened with Velib in Paris. Including “sharrow”s in the bikelane mileage count was NYCDoT’s own doping scandal. I use sharrows all the time, and while I’d of course rather have protected lanes, the reality is that they’ve made it safer to ride those roads, not least by encouraging more bike traffic on them. Right, but to include them in Bikelane mileage count?you agree? The Bergen St. corridor (from 5th Ave. to Smith.) is part of my daily AM commute. On nice days, especially this time of year (not too cold – not too hot), there are times when bikes far outnumber cars and the bike lane feels grossly inadequate for the volume of cyclists all going at different speeds. It would also help if DOT would fix the asphalt. That part of the street is a dangerous rutted mess, particularly between 5th and 4th Ave’s. Totally agree about the pavement. I also think we’re quickly reaching a place where allotting 10% of the street space to 50% of the traffic is untenable. It will cause a NIMBY freak-out, but the city really needs to eliminate parking on one side of the street and install a very wide bike lane. You just can’t justify private parking for 20 – 30 people per block when thousands depend on that street for safe passage. I live in eastern Queens and I wouldn’t be surprised if the mode share here for non-commuting was above 1%. Where DOT has installed bike racks I often see them in use. It’s a shame that most surveys only consider the mode of travel used for commuting. Bikes probably will never exceed a few percent mode share for commuting citiwide simply because for many commutes the subway is faster, or at least as fast, but for other trips, especially in parts of the city poorly served by mass transit, I think we can eventually see high double-digit mode shares. For places like where I live, bike travel is often the best option but we need much better bike parking, including safe, off-street facilities in places of business. Many people are understandably reluctant to leave their bikes chained outside given the high rates of bike theft. The streets are a mess in the entire city. Bloomberg may have done a lot to encourage bicycle travel, but I think we might have twice as much bicycle use today if we had simply kept streets in good repair. All it takes is a good fall and/or a bent wheel to discourage people from continuing to bike. I am the 1% !! Does this include the mega commuters like myself commuting 20 miles from Hackensack NJ over the GWB. There are more commuters from NJ using the GWB to commute into the city. On the weekends forget about the amount of cyclists coming over from NYC to Rt 9w going upstate the numbers are high very high. There are more bikes than cars on a typical Saturday or Sunday. Don’t forget about including the Jersey cyclists coming to the big apple. Yes, Doug you’re right. For example, look at this gigantic clump of asphalt/concrete/whatever that was dumped in the bike lane where Kent Avenue and Franklin meet. SUPER DANGEROUS. I had to take a picture after a guy wiped out on it (he was okay, he actually fell on to a car waiting at the light.) There are other spots on the Brooklyn Greenway Route like this that are just crashes waiting to happen. There is another bad one along the Navy Yard. Hey you 1%ers, Could you please consider donating the social cost of your biking (~$2.50/day) to a local charity or something? If you use citibike its only $2.00. For some reason the city/state gov’t seems unwilling to collect fair taxes for the infrastructure and space you consume… It would honestly make me much more comfortable with the problems that biking causes if you covered the externalities in some way. There are so many funny elements to this posting: the fake figures, the bizarre discounting of the fake figure for Citi Bikes, the use of “externalities” to give it that “I once overheard someone talking about economics” quality, the notion that drivers in this city pay even one teeny-tiny cent more for city roads than bikers, and of course the capstone of it all: the notion that addressing people on Streetsblog means addressing “1%ers” in anything other than a jokey way. So, all in all, impressive! Keep up the good work! Oy vey, you’re a smart one aren’t you? I suppose if my goal was to antagonize the died-on-the-cross cyclists of NYC I should take this as a complement. Out of curiosity, what would your approach be? Jesse, in NY State tolls, gas tax and other road usage charges only cover 50 percent of the cost of building and repairing of them.General taxes paid by everyone, including cyclists and commuters who don’t own cars pay the rest. So I already paid my $2.50 for the bike and about $25 to cover someone elses car trip. Could you please cite your source for this info? I’m not questioning it, I would just like to be able to use this info on another forum at some point. Thanks. Note that your source includes all roads in the state, many of the most capital-intensive of which are not accessible to bikes. Include only bike-accessible roads in New York City, and the contributions of tolls, gas taxes, and such would basically evaporate. “The problems biking causes.” That’s rich, and a good idea, too. Let’s all pay proportionately, Jesse. You first.